Justice Bhandari was re-elected for a nine-year term in the ICJ beginning February 2018. 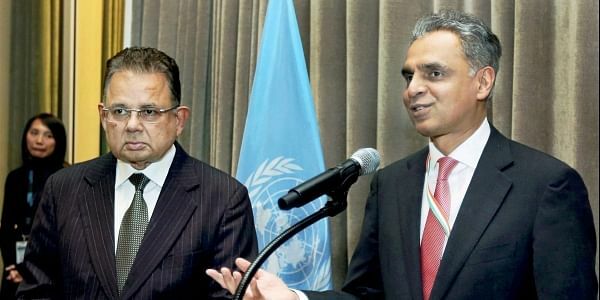 NEW DELHI: Justice Dalveer Bhandari’s re-election to the International Court of Justice – the world court – involved deft diplomatic lobbying combined with a play on the nerves of a Britain that recently lost another election on a judicial referral on its right to hold on to a colony in the Indian Ocean. External affairs minister Sushma Swaraj, who herself called counterparts in many countries to campaign for Bhandari’s re-election, specifically mentioned the efforts of Syed Akbaruddin, India’s Permanent Representative to the UN. Swaraj was herself praised by Prime Minister Modi for the victory. Justice Bhandari was re-elected for a nine-year term in the ICJ beginning February 2018. In 11 rounds of voting before Monday there was little doubt that India commanded the numbers. But the UK was seen to be exploiting its privilege as a permanent member of the security council. It was also weighed down by history – the fact that never before in its existence since 1946 has the ICJ been without a British judge. The eventual numbers, tweeted by Akbaruddin as soon as the voting was over were: General Assembly 183, Security Council 15. The figures were reached after the UK’s permanent representative wrote to the presidents of the assembly and the council that the candidature of Christopher Greenwood was being withdrawn. According to the rules, a winning candidate has to win a majority of the votes in separate elections in the general assembly and the security council. Till the withdrawal was announced, there was an electoral stalemate. Bhandari consistently won an overwhelming majority of the vote in the general assembly with 193 members but Greenwood was winning the majority in the security council. In June this year, the UK lost to Mauritius in a vote in the UNGA. Mauritius, that has been challenging the UK’s right to retain possession of the Chagos Islands – the largest of which houses a major US military base in Diego Garcia – wanted to refer the matter to the ICJ. Britain opposed the move. But Mauritius won 94 votes to the UK’s 15. India voted in favour of Mauritius because of its belief in the principle of de-colonisation. The Chagos Islands were retained by the UK after Mauritius’ Independence in the 1960s. Diego Garcia was given to the US on lease by Britain. Earlier this year, India and the US quietly operationalised a mutual military logistics pact – the Logistics Exchange Memorandum of Agreement (LEMOA). The pact would permit Indian warships and aircraft to access bases of the US military, and vice versa, for victualling and refueling. The US was also concerned over Mauritius’ move to assert its right to its islands because it worried about having to give up Diego Garcia. The island, that has only military personnel, is one of the most active US armed forces’ bases in the world. India also quietly favours the US military presence in the Indian Ocean Region where a burgeoning Chinese military is criss-crossing waters with an expanding fleet of submarines and warships. Akbaruddin, the Indian Permanent Representative, described Justice Bhandari's re-election as a "victory for emerging new India," and an "acknowledgement that the world now needs to make space for an asserting India."